Above: Burning snag on the West Stewart fire, Northwestern Colorado. As usual, time has been flying by and I’ve been in a non-writing mood for whatever reason. Time to address that I suppose. This was the first year since 2003 that I didn’t get a helicopter ride during fire season. Since I took my first flight to a fire in 2004, I’ve always had some flight time in the summer. Even in southeast Alaska I managed a few fire-type flights each season, mixed in among the many non-fire flights that were the bulk of my workload. Last year it came down to the wire, but I snuck in a mapping flight toward the end of my single, abbreviated helibase manager assignment in mid-September. This year, however, there was no last second reprieve, and the season ended (for me) with zero flight time in a helicopter. I did manage to stay current as a manager, but it was on a restricted category (no passengers) helicopter, which meant no flying for me. That’s not to say that I didn’t fly this year – I just didn’t get any helicopter time. I did a fair amount of flying in our Agency-contracted King Air, but that’s a whole different critter. Most of the time my view of the fire and surrounding terrain was an occasional glance of the column out the window as we circled at 12,000′ AGL, or through the 9.7″ screen of my iPad, wirelessly connected to the sensor package mounted to the bottom of the airplane. Pretty neat for sure, and different from the views that most people see, but lacking the same meaning to me. And of course, in the early parts of the season, I spent a lot of time on commercial jets, traveling to and from the southwest. When a person spends a decade largely identifying (in the professional sense) as a “helicopter guy,” it kind of hurts when you lose that identity. I knew when I left helitack for this job that I risked not being a “helicopter guy” anymore, but somehow it really didn’t sink in until this year just how much value I placed in that identity, and how much it would hurt to lose it. It’s also the first season since I started fire in 2001 that I didn’t dig any line or contribute directly to suppression or prescribed fire efforts in a real boots on the ground fashion. Sure, I’ve a few seasons where I didn’t dig much line, or spent most of my time on helibases or helispots, but this year marked the first season that all of my fire time was either as “overhead” (helibase work) or a “curious non-producer” (data collector). Not that I’m too concerned with that change, but it’s a change that I’m acutely aware of. I still have a role to play in wildland fire, but it’s a stretch to say I’m still a firefighter. I’m still capable and qualified to spend time on the line, grubbing with a hand tool on a hillside in the middle of nowhere, but it’s no longer my primary role in the greater fire organization. 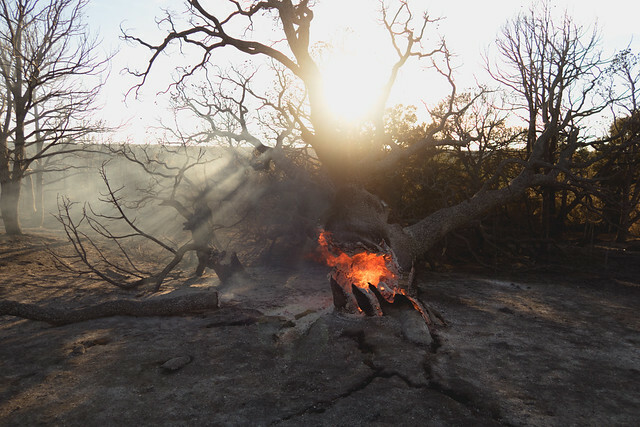 All things must end, however, and like this fire season, I think I’m at a transitional place in my career as well. As the leaves turn color on the brush, the larch start to paint the hillsides yellow and orange, and snow starts to dust the mountain tops, I too must weather the changing environment in which I reside professionally. The only constant is that it all changes. 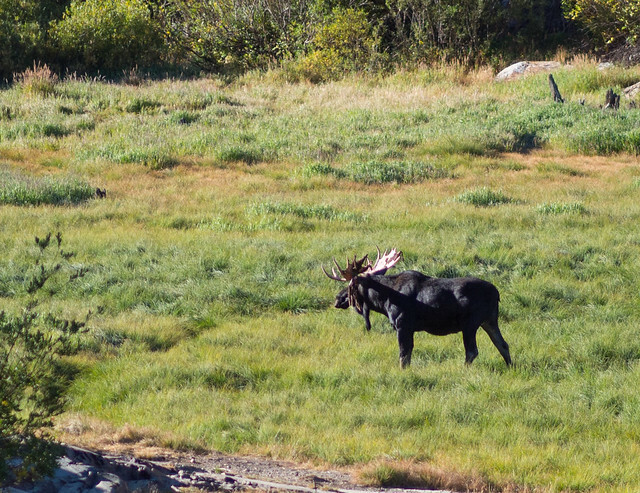 Above: Bull moose in the Twin Peaks Wilderness outside of Salt Lake City, Utah. All in all it’s been a good season, just different. I did a lot of traveling for work, spending time in Arizona, Utah, Montana, Colorado, and of course Idaho. I put in a lot of hard work which felt rewarding at times, and I know I gave it my best effort, even if it was quite a bit different than how I expected the year to go. I learned a lot, saw some new country (including some of the high country in the Wasatch and San Juans), and met a lot of new people. I feel like I made some good strides, personally and professionally, and while there’s always work to be done on that front, at least I weathered the stress of fire season reasonably well. For now I’m looking forward to a quiet fall and winter, and enjoying the start of the “off season” here in Idaho. I’ve still got a lot on my plate for work, but at least the near-constant travel is mostly over for now.